Anwar is a Lecturer in Accounting at the Open University. Prior to joining the OU, Anwar was a Lecturer at University of Buckingham, where he held a position of a Programme Director for the Accounting and Financial Management (AFM) Programme. 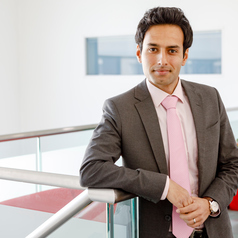 Anwar was awarded a First Class Honours degree in Accounting from the University of Dundee before gaining his Master’s degree in Accounting and Finance with distinction. Anwar was also awarded a PhD in Finance by the University of Dundee in 2013. Anwar mainly teaches Financial Accounting, Management Accounting, Financial Management and Corporate Finance at undergraduate and postgraduate levels. Anwar is an active researcher, he has published in various academic peer-reviewed journals within accounting and finance. His current research covers market efficiency, emerging stock market performance, market based accounting research, market anomalies, and Islamic finance and accounting. He has acted as an ad hoc reviewer for several academic journals and serves on the Editorial Board for two peer-reviewed journals.